Fifteen Iraqi women and children found themselves in the wrong place at the wrong time Thursday when the U.S. launched a series of airstrikes to back up ground operations targeting suspected insurgents. A further 15 insurgents were found dead along with six women and nine children. Something that botherd me as I was listening to this report today on my way home. How do we know that these 15 men were insurgents? How do we know that those who were insurgents did not all escape? Does anyone else notice that women and children are the only ones who are reported as being innocent victims yet all males are considered insurgents? Have we at any time heard that innocent men were killed? I think "insurgent" is the BushCo term for 'Iraqi male'. It's like Damadola all over again. There's a certain amount of deadly arrogance in this idea that we've got carte blanche to kill everyone else in the presence of the so-called enemy. 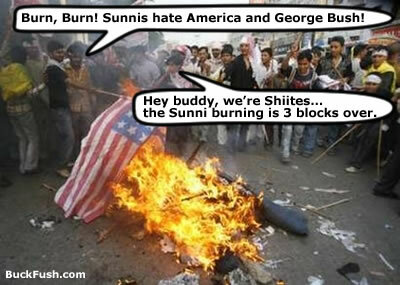 BTW, when in hell are the Iraqi's going to say, "That's it! Enough is enough! Get the hell out of our country!" I believe they have already said that, but no one is listening. Americans forget that often men accompany women wherever they go in the Middle East, even in Iraq, especially now. Iraqi women had a lot more freedom when Saddam Hussein was the ruler than they do under the American occupation. The Pentagon knows that the word "insurgent" is a synonym for "terrorist" to the kool-aid drinking American public who sees all brown people in the Midde East as being guilty of the WTC attack. As long as that belief can be maintained and used for all it's worth, it'll help keep the occupation intact, Congress controlled, and the neocon agenda rolling smoothly along. If I remember correctly, in Vietnam, women and children were sometimes found to be quite willing to kill any American soldier they could. Yet, so far in Iraq anyway, all the women and children are "innocent," and all the men are "insurgents." My opinion is that they're all just sick and tired of Americans being in their country. The Pentagon knows that the word "insurgent" is a synonym for "terrorist" to the kool-aid drinking American public who sees all brown people in the Midde East as being guilty of the WTC attack. Isn't that the truth! I am still fighting off people who insist on sending me emails calling all brown people 'the enemies' who want to kill us. They don't, but I don't understand why they don't. After what we have done to their country and their people, why shouldn't they want us 'off the face of the earth'? Those brown people have more integrity than the people who are running this country (and many of their followers). Isn't it odd that in the air attack that the US military claims killed 19 high-ranking leaders of Al Qaeda in Mesopotamia and 15 civilians, all the slain Al Qaeda members were men and all the men were Al Qaeda, while all the civilians were women (6) and children (9)? This means that no women were Al Qaeda--and yet we know that women also fight, and also blow themselves up as suicide bombers. Yet these women were all civilians. The children, of course, were children. And we're to believe that there were no men who were innocent bystanders? All those adult males who were killed were "bad guys." You know how they say, "Support the troops"? Does that include when they do bad, baaaaad things? Four bank employees have been killed as they travelled to work after American troops opened fired on their minibus at a roadblock in Baghdad, police and hospital officials say. The shooting, which killed three women and one man, took place in the Al-Shaab neighbourhood on Tuesday. The minibus driver was collecting employees to go to work at Rasheed bank in the area, which is known to be a Shia militia stronghold. This "support the troops" slogan seems empty, when you consider what they are doing in some instances. This sort of crap is un-supportable.